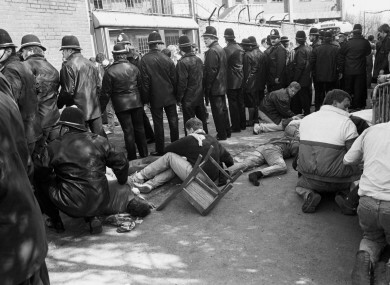 A line of Policeman shield some injured fans as they receive treatment at Hillsborough in 1989. TODAY MARKS ONE year since the Hillsborough Independent Panel (HIP) produced a landmark report exonerating Liverpool supporters of any blame for the 1989 stadium disaster in which 96 people died. But one year on and despite the quashing of the original inquest verdict of ‘accidental death’ in the case of all 96 deceased, some families have expressed disappointment at the slow progress of investigations into police misconduct and possible criminality. Yesterday, the police watchdog leading the investigation, the IPCC, said in an update that it has now established that over 200 police statements were altered in addition to statements given by fans, who witnessed events, that were also altered. Ninety-six people were crushed to death and hundreds injured at the Leppings Lane end of Sheffield’s Hillsborough ground on 15 April 1989 in the worst stadium disaster in British football history. In the two decades that followed victims’ families and survivors were thwarted in efforts to achieve justice and subject to a police smear campaign. No one was ever successfully prosecuted despite an inquiry finding that the main cause of the disaster was police mismanagement. The report of the HIP – which scrutinised thousands of documents – found that dozens of those who died had the potential to survive had they received proper medical treatment. It also exposed systematic altering of police statements to cover-up their culpability and smear supporters. Though new inquests are set for early next year, 21 families affiliated to the Hillsborough Justice Campaign said yesterday they are dismayed at both the progress and lack of independent scrutiny of the investigations. They believe that the Director of Public Prosecutions has reneged on a promise to establish a ‘challenge panel’ that would scrutinise two investigations into the disaster, one examining cover-up allegations and another probe which is considering the wider circumstances and possible criminal proceedings. In a statement issued through solicitors the families said they had conveyed their unhappiness about this to the DPP and the IPCC in a meeting last July: “They (the families) pointed to the lack of evidence of any real progress in the investigations and that they had been promised better. Authorities have now agreed to establish a panel which will have a limited role in the view of the families who are generally scathing of the progress of the investigations. “A year on, what has been achieved? The IPCC have yet to complete the reassembly of the documentation considered by the HIP, and have interviewed a small handful of police officers relating to ‘altered’ statements,” the statement said. The Crown Prosecution Service said that circumstances have changed since the original remit of the ‘challenge panel’ was discussed and the refocusing of the investigations in light of the new inquests. In a statement yesterday, the deputy chair of the IPCC Deborah Glass: “This is an ongoing criminal investigation the like of which has never been seen before in this country. Already we are uncovering more about the disaster and its aftermath. Fresh inquests into the deaths of 96 people who died at Hillsborough are set to begin in March 2014 – a month before the 25th anniversary of the disaster. Email “One year on: Hillsborough families left 'dismayed' by lack of progress”. Feedback on “One year on: Hillsborough families left 'dismayed' by lack of progress”.